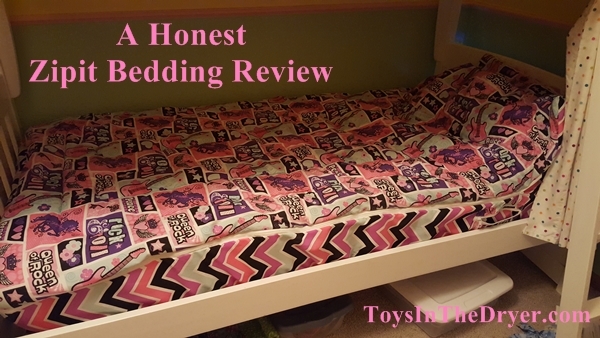 I was given Zipit Bedding­® in exchange for an honest review. No other compensation was received. All thoughts and opinions are my own. When my girls found out that we were receiving Zipit Bedding® for review they were extremely excited. They had seen it on a commercial (or somewhere) and thought it looked “so cool!” Since our package arrived three weeks ago, the girls have been fighting over who’s bed get’s the new bedding. I decided that they could each use it for a week at time (and I’ll order another set for Tottie’s birthday coming up). First and foremost, Zipit Bedding® claims to make it easier for you and your children to make their beds. This claim is NOT false! Oh my gosh, it was incredibly easy to put on the beds! My girls have bunk beds and I DREAD the days I have to change their bedding to wash their sheets. Not any more! I didn’t have to try to force the comforter around the guard rail on the top bunk…I didn’t have to fight with the sheets to make them fit…One step and I was done (without any swearing like I usually do)! Speaking of making the bed, the Zipit Bedding is like a sleeping bag. Zip it up and your bed is made. 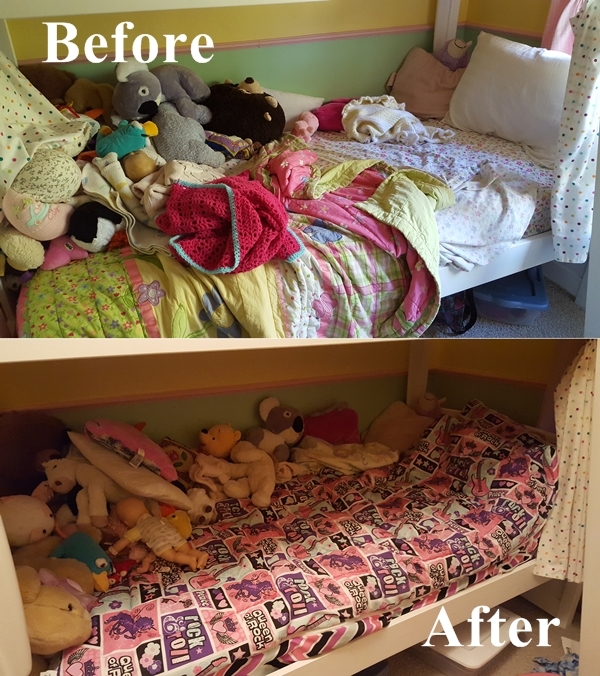 My oldest daughter loved this concept and kept her bed neat and tidy every day she had the bedding on. The novelty wore off a bit quicker for my youngest daughter but because the comforter always stays in one place, her bed looks made even when she doesn’t completely zip it up (see the photo below). Before I go on with some other positive thoughts, I do have to voice some criticism. 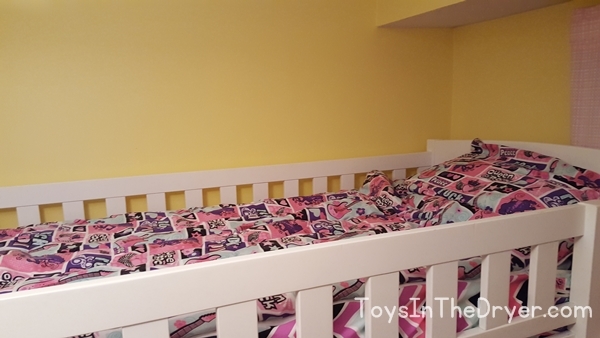 Zipit Bedding is meant for thicker, regular mattresses so it fit loosely on my daughters’ thinner bunk bed mattresses. The material is a bit thin and stiff feeling. Even after a few washes I thought the material was stiff feeling. My girls didn’t seem to notice or mind. There is no top sheet which means that you have to wash the comforter more often (it did fit easily in my washing machine). The bottom doesn’t zip so it is open. My girls are small so they didn’t have an issue with it but if you have a taller child who’s feet are close to the end of the bed, their feet might get cold. The funniest part of the whole Zipit Bedding® review? Prior to getting this bedding, my girls slept on TOP of their comforter and used their “blankies” to cover up with at night. They always complained that they were cold in the morning and we always told them to use their covers. With the Zipit Bedding® they sleep UNDER the comforter! I guess it’s “cool” to sleep in sleeping bag type bedding. Plus, Nutty said it’s easier to find her comforter because it’s always zipped in one spot. Unlike I show in the photos, it is reversible. My girls just liked the same side. The pillow case that comes with it also zips on! Nutty thought that was cool. I’m giving away a set of Zipit Bedding®! Please note, contest is open to US Residents 18 years of age and older. If you are under 18 years of age, please ask your parent’s permission before entering. I like the concept of this, but bummer that it was a little stiff. My little one has sensory issues, so he probably wouldn’t appreciate that. This is so cool! This would be great for both of my boys! My oldest is getting a loft bed and I’ve been dreading putting sheets on! I will definitely be looking more into Zipit bedding. Ooh, the girls would love the fantasy forest set! As the mom of a little one, we could definitely use this! Making his bed is sometimes such a struggle. That’s wonderful that the girls loved it so much. Anything to help them keep the bed neat and clean, right? Love the Outer Space Twin size. I would donate it to a family and kid I work with on the autism spectrum. This would be just perfect for him! Thanks for the review! I’ve been seriously looking at this for my 8 year old. Definitely would be great for her! Forgot to say, she would love the Fantasy Forest. Every time she or her Dad see an owl, they start hooting. It would make for a very fun and loud bedtime! I’d pink the pink/clovers design. My sons would love the outer space one or the Navy. What a great idea – I had never heard of this before. That would be so much easier on my daughter’s bed. The Wild Animals pattern is adorable! I think this is such a cool idea. I bet it’s nice and cozy in one of those! The bedding looks neat! My kids would probably love it! I would choose the outer space design. My daughter would love that in her room. My daughter has been asking about this bedding! I love how easy it makes it. She’s pretty good about making her bed now, but this would be an even bigger help! She’d probably pick the Pink/Clovers or Fantasy Forest. Was this on Shark Tank? I feel like I remember seeing is on there! So cool to see it come to life and looks like your family loved it! Wow I like this. Each of my kids have always kicked off their sheets and now my 2 yr old does. While I know this is meant to keep the bed tidy I think it would work great for that too. My youngest would love the outer space theme. I would choose the Fantasy Forest! Thank you for the wonderful giveaway. I need to get this for my son! He has a tall bed with stairs and it’s really hard to make his bed, especially because I’m really short. My son would love this and it would save a lot of time-I love the outer space print too! I love the sports print. This is such a great idea I saw it on Shark Tank awhile ago. I love the Navy/stripe print. My son would love it. I would pick the Outer Space design for my son. I love that these are reversible!